Growing up with diabetes is not easy. There are lots of things children and their families find hard. Daily management tasks can become battle grounds and it can be an emotional roller coaster. As a person living with type 1 diabetes since childhood and working in diabetes for many years, Helen Edwards wanted to offer families a resource which takes some of the stress and worry out of managing diabetes. 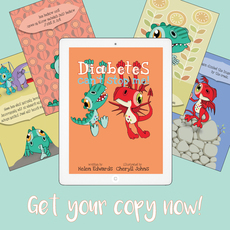 Growing up with her own diabetes struggles, working as a social worker for 25 years and using play therapy in her practice; as well as having hundreds of conversations with families about their daily lives with diabetes, all led to the creation of Diabetes Dino® – book, e book & soft toys. We hope you and your child enjoy reading and playing with Diabetes Dino® and Dragon, and that they can help you to have a calmer, happier and healthier relationship with diabetes.